One of my favorite shows when I was little was “Annie.” Like countless other kids over the years, I spent hours singing and dancing around my apartment to the music. We like to remember Little Orphan Annie for her optimistic signature song, “Tomorrow.” We tend to forget that a number of her other songs were fairly cynical. She didn’t go looking for trouble, but she defended herself and others when necessary. 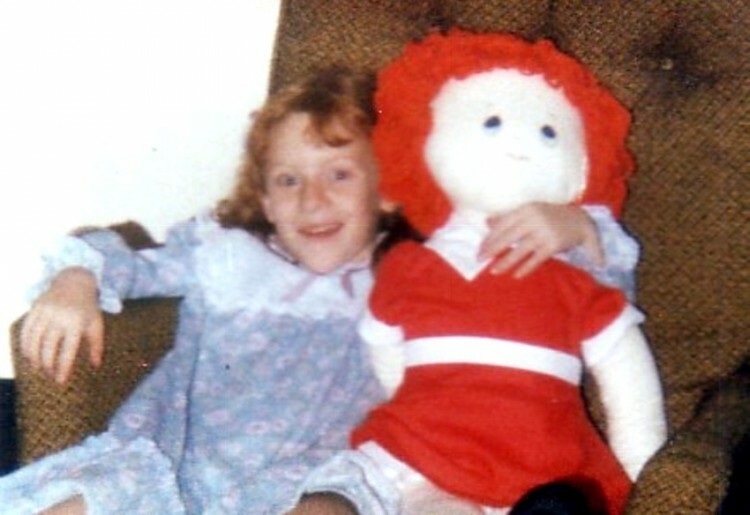 Young Denise and her Annie doll. Even though I am not religious, I love archangels: Raphael, Gabriel, and my favorite, Michael. Michael is almost always depicted brandishing his sword in one hand and shield in the other. Defense, not attack. I try to learn from that and remind myself of several caveats as I go through my life: Don’t attack. Defend. Don’t take your upset or frustration out on others. If you’re angry, own it. Know it’s there. Welcome it. Make it a shield and put it to work in the most beneficial and least harmful ways possible. Those who believe “happiness is a choice” might find that view abhorrent. That’s fine. What works for one person doesn’t always work for another. I’m usually pretty smiley, but I’m not going to cut off half my emotions or give them negative labels. If I pretend that feelings like anger or sadness aren’t there, and I don’t give them the time they need to run their course, it never works well for me. Anger tends to be really productive for me, so when it shows up, I welcome it. My most recent annoyance: a specialist who requested, and received, an authorization from my HMO for a medication they’d ordered for me… but abruptly decided to withhold treatment and told me they never administered the med to people with my insurance. Among their suggestions: violating their HMO contract and billing me. They also suggested I could wait until October, when the Health Department would have the med in stock, and get it from them for free. Doing so would delay further treatment for a serious condition for several months, but that didn’t seem to bother them. I actually sympathize that doctors don’t always get reimbursed adequately, but I found this abhorrent. They’d agreed to accept the contracted payment when they’d put in the authorization request. If they had no intention of administering the treatment because of my insurance coverage, they shouldn’t have wasted everyone’s time getting the authorization. They should have told me they couldn’t help and referred me to another specialist. Asking me to delay my treatment for months when they had an authorization in hand was unacceptable. On its own, this would not have been a big deal at all. However, when I was busy fighting a long and bloody war on several fronts with numerous chronic illnesses and conditions, I just didn’t need more fuel for the fire. Under normal conditions it took as much time to manage logistics as it did to receive treatment, and it was exhausting. Between the end of June and the end of July, I had about 17 different medical appointments and procedures. When I counted it up, I discovered I’d had three enjoyable days the entire month. The rest? Flares, pain, and procedures. Even with my normal coping techniques, it wore on me. My new MRIs had revealed numerous abnormalities up and down my spine, one of which was fairly complex. I had some bad blood work results. I was going through numerous unpleasant procedures on both feet. I’d had numerous severe headaches, including one that hung on for three days. I didn’t have air conditioning and it was in the 80s or 90s every single day. I struggled to compile all the materials I needed for my disability case. One of my cats was especially out of control. It all triggered a fibromyalgia flare, and my normal level of exhaustion, which is somewhere around an eight, ramped way up. Pain? Let’s not even go there. On the same day the drama with the specialist arose, I’d endured the most painful foot procedure yet. It was just one thing too many, and it brought the house of cards down. I did what came naturally: I took a nap. When I woke up I felt much better, because sleep had transformed my frustration into cool, efficient anger. I assessed how I was feeling physically and what was causing immediate problems or pain. Once I’d tended to that, I wrote myself a list of all the things I’d need to do to find a new specialist and get my records transferred. There was no question in my mind about firing my current specialist; even if the medication issue was resolved, I didn’t have any guarantee that they wouldn’t pull the same stunt again later. I couldn’t risk it. As much as I dislike relentless entreaties to look on the bright side, I reminded myself that I did have something especially fun tucked among the medical appointments for August: a cheap ticket for a Guns N’ Roses concert. Guns N’ Roses holds a special place in my heart, I’ve seen them several times over the years, and they’ve been one of my anger management helpers since grade school. I couldn’t really afford it and knew it would lead to other cutbacks, but I’d missed out on so much and I needed something to look forward to. By the time I finished my list, I realized that I wasn’t anxious about the latest bit of stress anymore. My anger had helped me focus on creating a concrete plan for handling the situation. Having done its job, it had dissipated naturally. I’m still shouldering the weight of too many challenges and too much stress, with too little help and no hope of change. I have no delusions that everything will be OK. My hope flickers cynically and realistically. There still aren’t any great treatments, much less cures, for some of my illnesses. I am still feeling completely forgotten much of the time. I’m still deeply worried about finances. It’s one of the reasons I really feel there needs to be more attention paid to the emotional and logistical needs of adults with chronic illnesses and disabilities — we’re juggling so much, we might not have a lot of day-to-day support, and our path is treacherous. I’m angry. I do my best to make it work for me. It won’t solve everything. It can’t. It’s not magic any more than any other solutions would be. Still, my rage is the raft keeping me afloat at this point. It beats drowning.